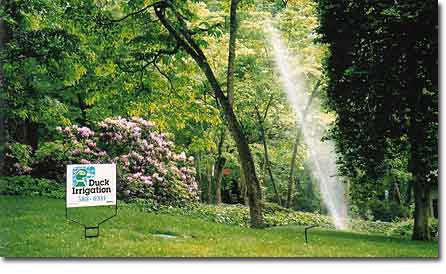 Duck Irrigation serves the Greater Knoxville area with the finest in irrigation services. We start with your ideas and use our vast experience and knowledge to formulate a design. Duck Irrigation has successfully installed over 3500 irrigation systems in Knoxville and the surrounding areas. This is what we mean by 100%! Copyright © 2001-2009 Duck Irrigation, Inc. All rights reserved.